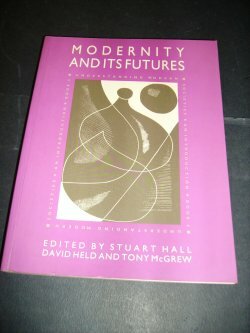 Modernity and its Futures is a major introductory textbook which examines the forces reshaping modern industrial societies and the new patterns, structures and relationships that are emerging in the contemporary world. The key debates about these changes are introduced and critically discussed; they include the transformation of Eastern Europe, the collapse of the USSR, globalisation, environmental challenges, post industrialism, cultural change and post–modernism. The book also looks back to the formation of modern societies, and of social science, to explore the character of 'modernity' and the relationship between 'early–modern' and 'post–modern' societies, and assess whether the paradigms and theories used to analyse 'modern' societies are adequate for social formations today. 391pp. N.B. Previous owners inscription to ffep. Corners of covers slightly rubbed.